Zocor Medication Side Effects – How far they will damage your precious body? Zocor Medication Side Effects – How far will they damage your precious body? What are the Zocor Medication side effects? How far will they harm you? Is there a way to eliminate the side effects? If not, how about an alternative? As per all the cholesterol drugs, Zocor side effects can affect your body. To know the Zocor bad side effects, first you must understand how Zocor works. Zocor is the brand name of Simvastatin, a lowering cholesterol drug. It is part of statins, a group of drugs for lowering cholesterol, which inhibit the HMG-CoA reductase, a liver enzyme which is a crucial part of cholesterol synthesis in your body. By doing this, Zocor is trying to lower your total cholesterol, LDL (bad) cholesterol and triglycerides. It can slightly increase HDL (good) cholesterol and FDA has approved it since 1991 to use as cholesterol lowering drug. 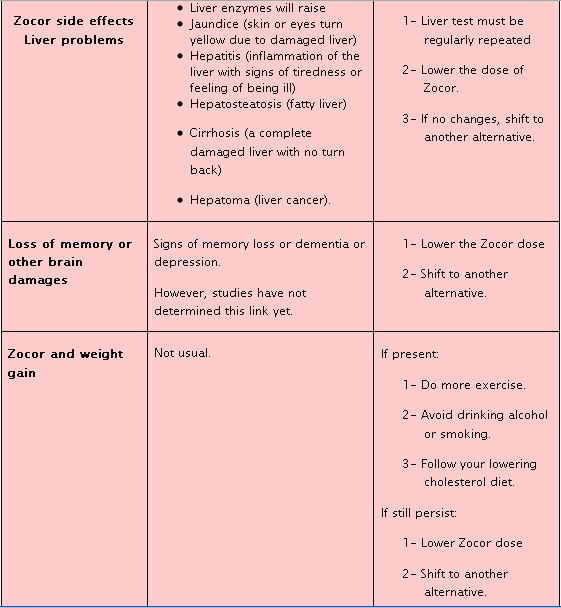 What are the Zocor Medication Side Effects? 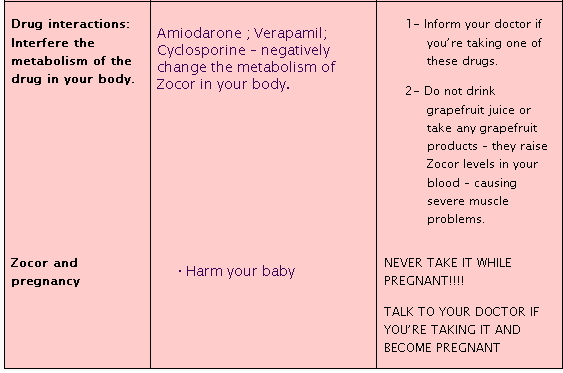 To make it simple, find the side effects listed in the following table. It is advised to seek medical help in case you notice the side effects, do not wait longer. 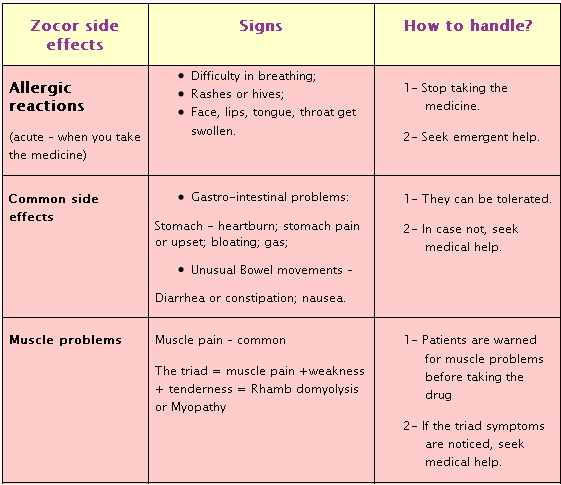 If you are suffering from one or all side effects of Zocor, there are some alternate medicines you can take. 1-	Within the same statins group: lovastatin, sosuvastatin calcium or atorvastatin calcium. 2-	Other groups of lowering cholesterol drugs (fibrates (Tricor, Lofibra, Lopid); bile acid sequestrants (Questran, Prevalite, Colestid); Nicotinic acid (Niaspan, Niacor); Inhibitors of cholesterol absorption (Zetia)). Don’t forget the TLC (therapeutic lifestyle changes); the natural and no side effects alternative for your high cholesterol to avoid Zocor medication side effects or any other drugs fastidious side effects. NATURE REMAINS ALWAYS NATURE! WE ARE A CRUCIAL PART OF IT! LET'S ENJOY AND GET THE BENEFITS! How far can the Drugs for Lowering Cholesterol can lower LDL cholesterol? What are the New Cholesterol Lowering Drugs approved by FDA?